I love fireplaces. In fact, it may be one of those things on my "must have" list for whenever we buy a house. Being warm and cozy is a top priority for me and a fireplace definitely adds that factor. Out of the four houses I remember living in while I was growing up, only one had a fireplace. I love having one in our current house. 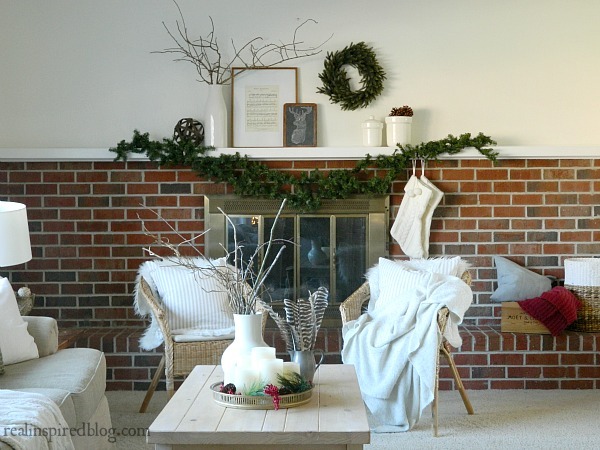 Of course, one of the best things about having a fireplace is having a mantel to decorate! Every room needs a focal point; one wall that makes a big statement and gives the eye something to focus on upon entering. Generally, a fireplace will automatically determine which wall is the focal point in a room. When we first moved into our house, I was lost on how to decorate our long mantel. It stretches across an entire wall in our living room and it makes a big statement all on its own! I liked that it made an impact, but I didn't know how to decorate it. The internet was no help either. No blogger or designer really had anything to say about long fireplace mantels. The few photos I did find were more a lesson in what not to do. It seems there are two things people tend to do when decorating a long mantel(or any mantel for that matter) and that is, one, using items too small in scale, and two, decorating the entire length of the mantel. Over the past couple of years, I've identified what seems to work for our long mantel. And really, most of it is just following what works for normal mantels. 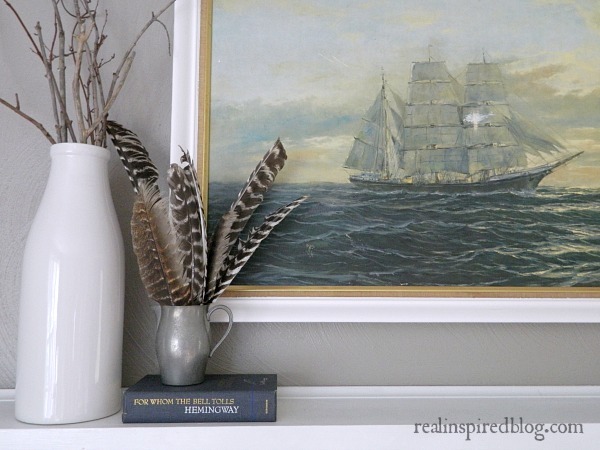 A good mantel design has several "layers" of items. 1. Pick a focal point. I don't like decorations spreading the length of a long mantel. 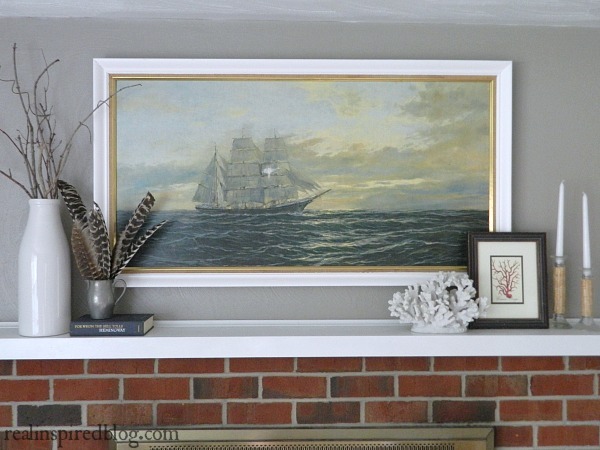 It makes the mantel look confused and cluttered without creating a stunning, eye-catching focal point. Your eyes will be all confused because there's no one spot for them to land. Unless you wanted to go with the whole jungalow look and cover your long mantel end to end in plants. A plant wall would actually be pretty cool, especially for a more modern or bohemian style! A traditionally styled mantel is more symmetrical and centers the decorations directly above the fireplace opening. For a more modern style, you could get away with off-center and asymmetrical. 2. Large anchor piece or art grouping. The basis for a well-styled mantel is one large piece or a grouping of a few similar larger pieces that balance out the largeness of the fireplace and mantel. It grounds the design and adds vertical height above a horizontal mantel. 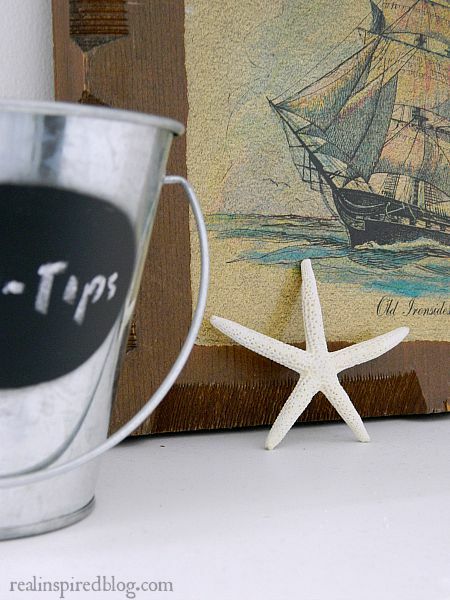 A large mirror or art piece is perfect leaning on a mantel or hung 4-6 inches above it. 3. Add visual weight and movement. After adding one large statement piece, it's time to add in some smaller items that create interest and add more weight and movement. These aren't small things, but items that are more medium in scale to the largest item. Layering items that are different in size and height add dimension and help the eye flow up and down across the mantel. The very smallest items should be saved for last. 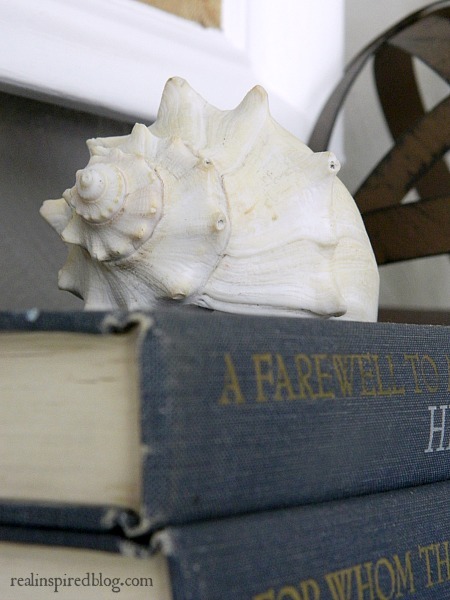 Most of the time I skip this last step because Hubby and I both favor a simple and clean look, but sometimes I do like to add a random shell or starfish. 5. Group items in odd numbers. The human eye likes to see things in odd numbers. Three is probably the most common one that is used. This rule goes for everything in design: painting, flower arranging, hanging pictures...in the photos below, you can clearly see the use of threes. A grouping of three on each side and a small grouping of three pumpkins in the middle. Yes, there is more than one book in a group and more than one candle but the eye still reads it as a grouping of three because they are all like items. Notice each group of books is stacked in threes too. Odd numbers just work. 6. Work in a triangle shape. Working in a triangle goes back to those odd numbers again(since a triangle has three sides). There should be one big overall triangle that peaks at the top of the largest item and then slopes down each side. 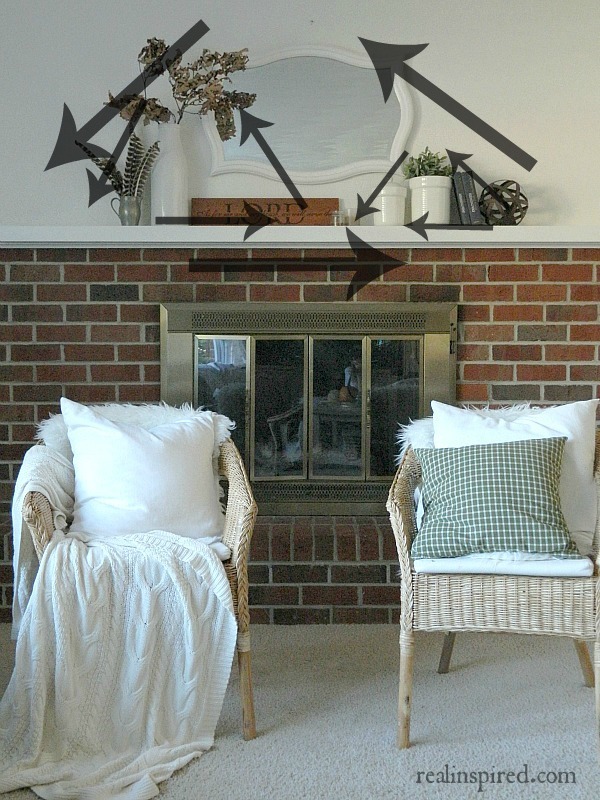 Each grouping of odd numbered items should form smaller triangles across the mantel. If you want to go back and look at all the pictures in this post, try looking for as many triangles(even sideways ones) as you can see. I almost left this one out but making sure everything feels balanced is also important. I like to stand back periodically while I'm arranging to make sure that I don't have all the darker colored objects on one side or vise versa. Same goes for different textures. I've learned that ignoring the sides of my super long mantel and centering my mantel decorations helps create a larger focal point for our living room. I have enough clutter around my house without spreading it out across the mantel for everyone to see when they walk in! 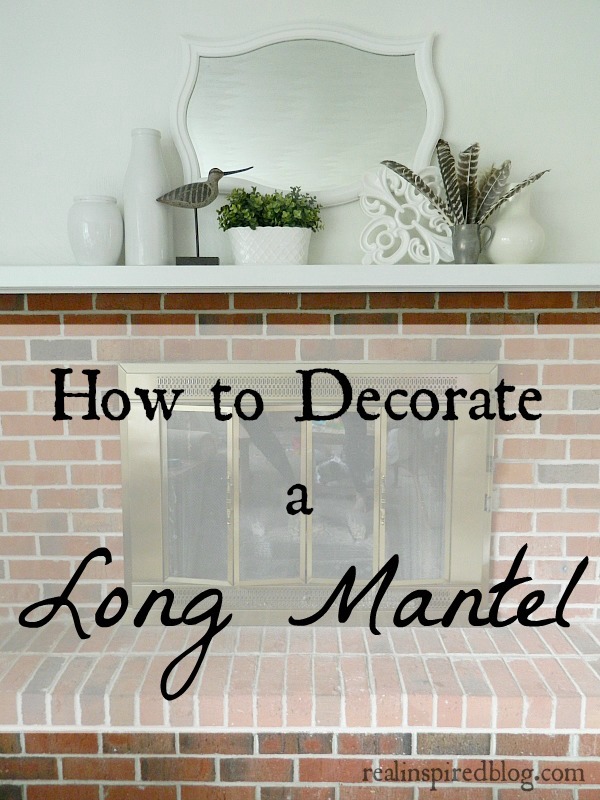 Has anyone else struggled with a long mantel? Or any mantel? 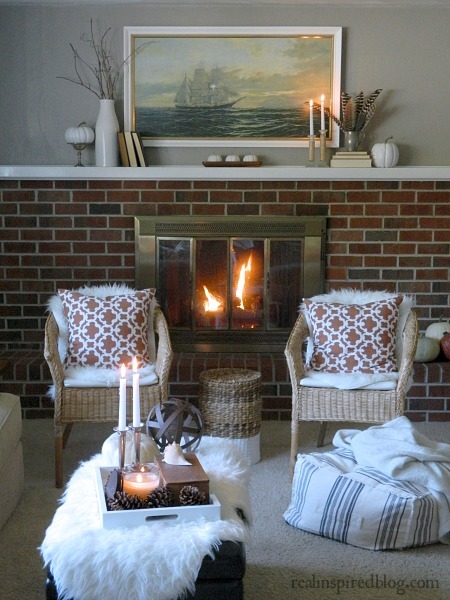 If you have a fireplace, mantel decor is such an important part of creating a cozy space. I hope breaking the process down into steps has been helpful!